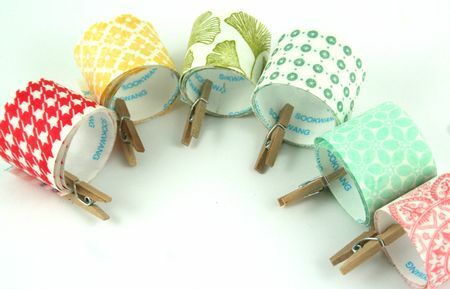 Washi tape is a new trendy product that seems to be popping up on many projects nowadays. Today I have a quick little video for you showcasing how you can create your own custom stamped washi tape, allowing you to create your own to coordinate with all of your favorite Papertrey colors. Enjoy! Here are a few still shots of today's project. 1. Background Basics: Houndstooth with Pure Poppy ink. 2. Background Basics: Diamonds with Summer Sunrise ink. 3. Harvest Berries with Ripe Avocado ink. 4. Background Basics: Twinkle with Ocean Tides ink. 6. Mehndi Medallion with Berry Sorbet ink. –Create a project utilizing your take on the challenge. 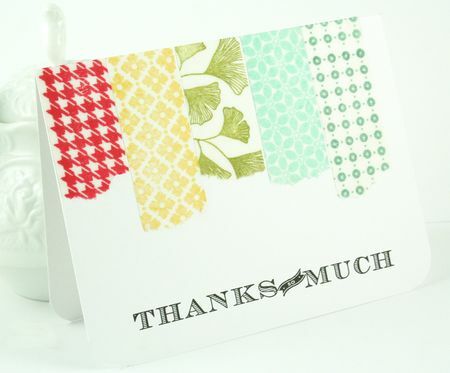 Your project must use at least one Papertrey product and feature custom stamped washi tape. –You will have until 7am, Monday, October 8th, to add your link to the list to be eligible to win. And you can enter as many times as you like. –One randomly selected winner will be chosen from ALL the entries on Monday, October 8th, after 7am. The winner will be posted here on this blog post, on Twitter and Facebook. The randomly selected winner will get to select a FREE Papertrey stamp set of their choice! Edited to add the random winner: LIZZIE D – congrats!! You're the winner of the Make It Monday challenge. Please email customerservice@papertreyink.com with your mailing address and stamp set choice. Thanks to all who participated in this fun challenge! Oh wow wow wow how simple is that, i knew there was a reason that i have kept all of my tissue paper from my stamp sets. Thanks for sharing this idea!! Have a GREAT day! T-H-A-N-K Y-O-U!!!!! I always wanted to have washi tape with my favorite colors and patterns. Thanks so much for sharing the technic. I have tons of tissue paper from the stamps set, I am so happy! I am very intrigued for the “new” ink! Aqua mist is one of my favorite and having again your ink is a dream come true …. Wow! What a great idea! I knew I was saving all that tissue paper for something good! Fantastic!!!! You are so creative. I am running to fetch my scortape right now.very excited about this post. Love it! 🙂 This is such a fun and versatile technique! Wonderful video, Nichole. Great Idea. I can see all kinds of possibilities for this. I also noticed The New aqua mist ink! Excited to see the perfect match inks coming back in their ‘new’ form. Love this idea Nichole, thanks! great post! i eally liked it! thanks for sharing! When I first purchased Scor-Tape, I bought it in every width that was available, and I’ve since had moments of wondering what I was thinking in buying the wider rolls. Now I know! I love washi tape, but I’ve bought very little of it because it’s so darn difficult to decide which lovely pattern appeals most, when the answer is “Most of them”! This should be fun — thanks so much for the inspiration! great idea! I can’t wait to make my own. I am so glad that I have been saving my PTI tissue paper. I knew it would come in handy someday! Love this! Thanks for yet another wonderful idea! What a great way to recycle all that tissue paper. This is a great way to add charm to my cards. This DIY washi tape is too wonderful for words. I was trying to think of how to do this & even bought some paper tape from an art supply store online, but it was all plastic-like when it arrived. You are too clever for words! Thanks so much! WOW! I am so making some “washi” tape now — I could never rectify spending money on a whole roll that I knew I would never use up! This is such a fab idea! THANKS for sharing! What a cool technique! I have no 1″ scor-tape, but I do have 1/2″ tape and totally want to try this! WOW. Really, WOW. I have loved the look of washi tape, but have never used it on a card before. I have also never found a pattern that is exactly what I am looking for…so this is really perfect…I can creat my own!!! AWE-some. What a great idea, Nichole. Now I am going to hunt and peck for some tissue paper and get started 🙂 Thanks so much!!! This is SUPER COOL!! Sorry, just had to shout there. What an innovative way to use basic supplies. The possibilities are endless! This idea is so unique and incredible!!! I can’t wait to try!!! AWESOME idea! Like many who have already commented, I’ve been hesitant to buy Washi tape because it was hard to justify the cost. Now I can create my own thanks to your tips! YAY! i LOVE this idea!! thank you! LOVE this Nichole..thank so much for this super great idea and great video…i am so happy i kept all the tissue wrapping from the stampssets! Wow! I am blown away by this technique! Way to think outside the box (again), Nichole! Get out of town! Seriously – this is SO cool! I can’t wait to get my hands on some score-tape & make me some if this stuff. How fun!! Thanks for the tutorial! What a great idea! Thanks so much for sharing this. I’ll be trying this later for sure! Way cool. Thanks. Going off now to try it. Have a great day. Oh I LOVE this!! What a great idea!! I’ve wanted to use washi tape for a while but have hesitated because I didn’t want to spend so much money for a lot of tape that wouldn’t get used. Now I can make my own and not waste! Thank you!!! Brilliant idea! I will have to try this! Thank you so much for the fabulous inspiration! How cleaver are you? Love this idea! Wonderful idea – it looks so pretty! This is such a cool idea…thanks! WOW!!!! Thank you for sharing. I had no idea I could make my own washi tape as well as no idea how simple it could be. The ideas are swirling right now, but unfortunately, I have to go to work. I will be experiementing with this soon though! Thank you again! Hi Nichole…loved this technique that you shared. Can we use any kind of tissue paper for this? I unfortunately do not have any of yours that you pack your stampsets in. Thanks! WOW! WOW! WOW! That says it all, Nichole. I love the look of washi tape, but haven’t purchased any yet. I love that I can make my own now with supplies I already have on hand. THANKS! I love love love this idea! Thank you so much for sharing! What a fabulous idea! I noticed you used the new Aqua Mist ink pads for your first tape. Can’t wait to try those. What an amazing technique so full of possibility! WOW!! I don’t know how you come up with these incredible ideas but it’s no wonder you are the queen. Fully deserved!! 🙂 Thank you for sharing your gift. Hi Veronica, yes, any tissue paper will do! Thanks for answering my question Jenn! WOWZERS!!! LOVE this idea! Beautiful project and awesome video!!! Very cute. I like it! Not sure why the inlinkz collection is closed on Saturday night but here’s a link to mine anyway. Didn’t quite come out as I expected, but I didn’t have any wide enough tape. Love the idea of stamping on the tissue paper though! thank you so much for sharing this tutorial with us, I can’t wait to try it. Beautiful card too. Love the idea.The perfect combination of great art and passion are seen on this post.Very creative and nice to know that there are people who are really into artistic designs. I’m just blown away by this technique. I don’t know how you come up with such amazing ideas, but they seriously ROCK! Thank you so much for sharing these wonderful ideas. Luckily, I keep all my tissue paper and now I can use it to customized my own washi tapes. These tapes make great LO’s! I love how new ideas keep coming up and especially this one that really costs no more than your time to do. Roller-graphs would be a good to use too.Thanks. 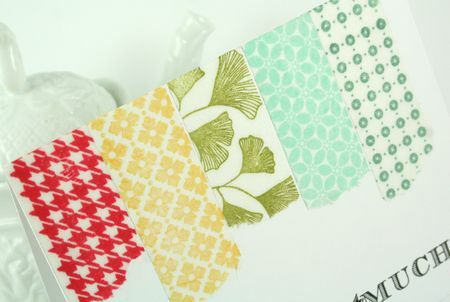 The best video I have seen for making Washi Tape. Thanks!! where do I buy scor tape? What a great tutorial. Can’t wait to try it, thanks for sharing. I love, love , love, this. Thanks so much for sharing. You always come up with awsome ideas that are so practical. Thank you for your awesome video,, this I can do and since the tape is still popular I will!!! So fun and easy. Thank you for the idea. Love your card. I am so gonna try this. Wonderful! But I’m new to this – what kind of tape did you say you began with? Great idea!I would love it if you joined and contribute your awesome posts at my link party at City of Creative Dreams, starts on Fridays 😀 Hope to see you there at City of Creative Dreams Link Party.